I am from the Philippines. I grew up in the big, bustling city of Manila where colourful jeepneys rule the streets and tiny flap in the wind. I would recommend the city to travellers looking for a cultural experience, but those looking for adventure should explore the Philippines’ 7,107 islands. Two Decembers ago, a couple of friends and I ventured to Mati, Davao Oriental, where the best skimboarding beach was rumoured to be. 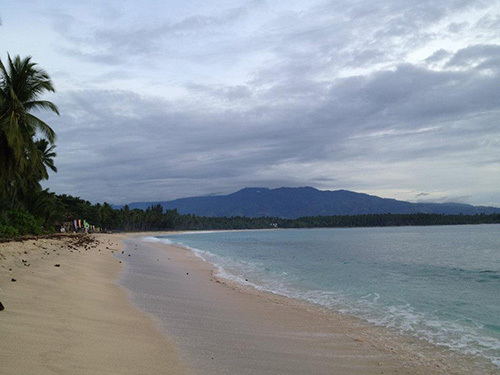 Mati lies near the Southern tip of the Philippines and is a small, yet lively town. We arrived at lunchtime and stopped at a hole-in-the-wall for a bite to eat. After lunch, we found a tricycle that, after a long and bumpy ride, took us to Dahican Beach. If the tricycle ride wasn’t telling enough, Dahican is most definitely off the beaten tourist path. We checked into the only resort in the area, plunked our bags down, and headed to the beach. The shoreline was deep and swooped into the water, and the sand? The sand was perfect- fine, white sand with little to no debris; perfect for skimboarding. We came across a few guys with boards who were doing amazing flips and all kinds of tricks in the water. Their skin nursed deep, dark tans, the kind that you only get from months – nay, years – of beach time. It looked like they had boards to rent out, so we ended up with some of their boards, and a few surf lessons. We did more surfing and skimboarding during our stay, but I don’t really remember much of it. Mostly, I remember our conversations with Kuya Jun, the team’s founder and father figure. He told us about their philosophy: train, take care of your body, and take care of the beach and the wildlife. They rarely used or needed money, which was a completely foreign concept to me. When they did need money, they would take the odd coconut or pineapple to the poblacion to sell. Kuya Jun told us about their strict rules against smoking and drinking, and how the whole team loved listening to Jack Johnson in their down time. I still revel at how lucky I am to have met such amazing, unique people in that tucked-away corner of the world. The Philippines has some of the most breathtaking landscapes in the world, but I love the fact that my fondest memories are always of the people, not the places.